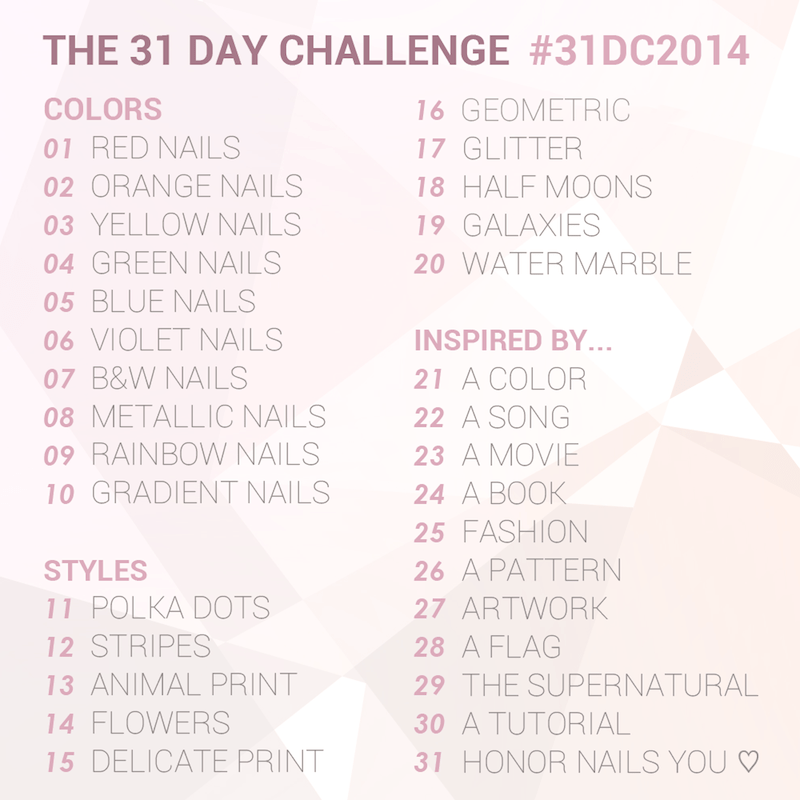 I mentioned in the first post of the challenge how I was quite nervous about the ‘colours’ prompts. I was quite excited about the ‘styles’ prompts. Until I started doing them of course :/ I had all these lofty ideas but so far, nothing is working out the way I had hoped. So I give you, my meh polka dots nails. I started with a base of 2 coats of Tip Top – Triple putty on my middle and pinky and 2 coats of China Glaze – Shore enuff on my index and ring. When that was dry I used the opposite of the base colour and painted each nail half way vertically. I then used my big dotting tool and the same colour of the base and made a row of polka dots on the opposite colour. I then used the opposite colour to the base colour and the same dotting tool and made a row of dots again, this time half overlapping the previous dots and half on the base colour. Lastly, I used the base colour again and a small dotting tool to make smaller dots inside the second row of bigger polka dots. Topcoat and done. Even though I like the idea I just couldn’t execute it perfectly. I redid these about 5 times and even tried a different alternative. Gah. Let me show you another attempt. Anyway, it is what it is right? At least the polishes were pretty. Let me show you. This is 2 coats with no topcoat. I love this colour especially in autumn / winter. I wish I had worn it more often. It’s a taupe / brown creme with beautiful formula and really opaque. This is 2 coats with no topcoat. It’s a bright green creme. It’s a little streaky on the first coat but evens out well on the second. I did find you need to give it a minute or so extra between coats. Otherwise it is quite stunning. So what do you think of my failed polka dots? Do you also think the colours at least look pretty together? <3 it!!! Well done M! i really dig the colour combo!! I don’t think these are a failure at all. These are fab! I like it done diagonally better but both are so far from “fails”! I agree with everyone that I don’t see any fails here! I think I like the top one best. The color combo is unique and they’re almost 3D-looking when you try to figure out the pattern, haha.